Despite internal volatility, the Solo Blog Index moved sideways for a second straight week as big gainers offset big decliners. The Team Blog Index eked out a one point gain as a big uptick in ISmellThereforeIAm pulled up the other three component sites which all showed losses. 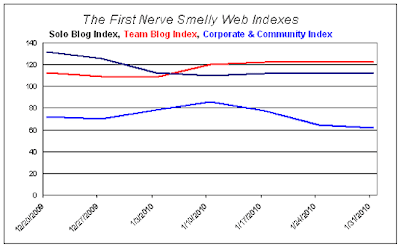 The Corporate & Community Site Index dropped another two points from last week’s record low; Sniffapalooza was the only gainer in the group. Alexa rankings are time-weighted across the past three months. There will be lag before a surge in the current week's traffic registers on the ranking. I suspect (but can't prove) that multiple page views per visit and comment rates also influence Alexa rank. I think these rankings are reasonable long-term indicaters of relative traffic volume but that much of the day-to-day variability is statistical noise. One reason I created the Smelly Web Indexes is to have a gauge of the overall marketplace--the big picture will be less "noisy" than any one site's traffic rank.